Click the picture to view the plan. The Buntingford Community Area Neighbourhood Plan (BCANP) has now reached the final stages of its journey to being "made" by East Herts District Council. The journey has been long and tortuous but the result of the work done by our Neighbourhood Planning Consultant and the Neighbourhood Plan Team has resulted in a Suite of Documents that are professional, meaningful and evidence based. The Plan, when "made", will give the residents of the Buntingford Community Area (BCA) the ability to influence the future development of the BCA. The BCA comprises the villages of Aspenden, Buckland & Chipping, Cottered, Hormead, Wyddial and the town of Buntingford. The document is supported by a plethora of evidence making it extremely robust. 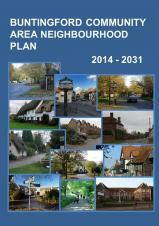 Neighbourhood Plan Forum Agendas & Minutes are available for viewing here. All responses from our Section 14 consultation are available for viewing here. The 6 week public consultation by East Herts District Council finished on 30th June 2016. East Herts Council reviewed the examiner's recommendations and made any necessary modifications to the Neighbourhood Plan before publishing a decision report before the referendum. The next stage in the Neighbourhood Plan Journey to being 'made' is the referendum on its acceptance by the Buntingford Community Area. The referendum date was on Thursday 23rd March 2017. The community voted overwhelmingly in favour of the plan, with 1268 votes (94%) voting yes in the referendum. The plan has now been accepted and will be used as a material planning consideration when deciding any future planning applications in the area. The plan will be under review in the future to update any information that may become incorrect. However, no timescale has been set for any reviews at this current time.